Hale Ohana, “family house” is nestled in a charming neighborhood, Hale Ohana is located a short 10 minute walk to the world's most beautiful crystal blue waters and sandy beaches in the Poipu Beach Resort area. Surfing, swimming, body surfing, sunbathing, snorkeling and family fun await you. Whether you're a group of 6 or 2 -- whether you're visiting for 5 days or 2 months -- you're sure to be comfortable with the many amenities Hale Ohana has to offer. Our home is fully furnished, sleeps from 2-6 people! With a newly remodeled kitchen in December 2015, your family will have more comforts of home! 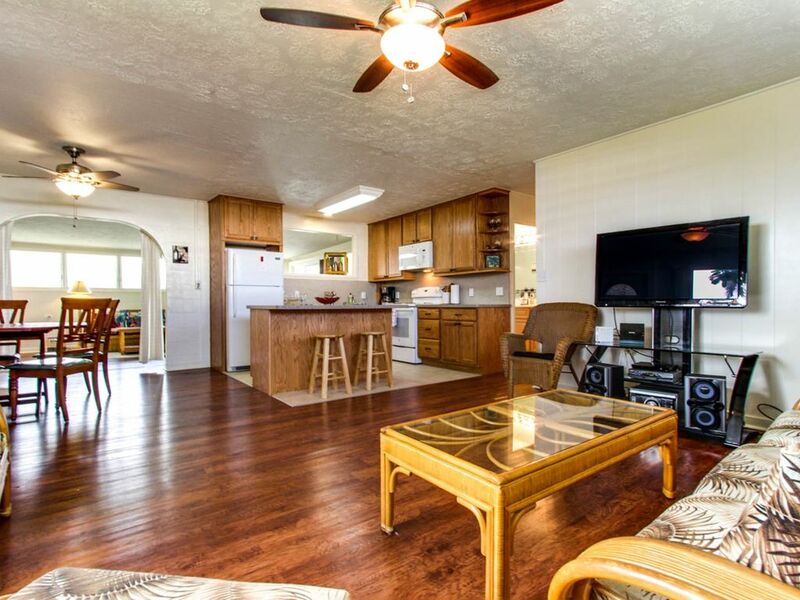 Beautiful trade winds run through the house giving you the feel of living in the Garden Isle! Within a 2-5 minute drive are breathtaking views of incredible sunsets, blow holes, whales, turtles and amazing crystal blue waters of Poipu beach. With a brand new kitchen completed November 2015, Hale Ohana boasts amenities for the entire family! Children are welcome and our home is 100% kid-friendly with sand toys, boogie boards, a portable crib and lots of running space for active play during the times when you're not out and about. A stay at Hale Ohana, will be sure to create lasting memories! We purchased this property in 1970 and have enjoyed it until 1981 when we relocated to the Bay Area. Since May 2017, we now live back in the islands. Our Hale is very ohana friendly. The property sits on a large piece of beautiful Kauai aina. Code is on the refrigerator! Hale Ohana as all you need for a day at the beach - towels, sand toys, chairs, umbrellas, snorkel gear, beach mats, coolers...and much more! Second time renting this home and we had a great time! We rented Hale Ohana several years ago when we were visiting Kauai with our family and mother in law, and we decided to rent the same home again this year. Yet again, it was perfect for our needs! We love the improvements you have made to the home. We wish you all the very best and hope to come back again next year. Great, affordable rental! Everything we needed and close to all. Bonus points for location, cleanliness and details. We stayed here for 11 nights and would come back next time we visit. The house was clean and had a wonderful, close location to our favorite beach. The big back yard was also fun for the kids. The kitchen was well stocked, perhaps the best we have seen in all our travels. We were pleased with the bedding setup and amount of extras like pack n plays, cot and pads in the bedroom closets. There were so many sand toys, umbrellas, beach chairs, boogie boards, etc in the garage which are all things you cannot pack. We especially liked the washer and dryer access since we have young children and they can’t keep their clothes clean for very long:) The window cooling unit in the master was nice to have, and they have made sure each room has ample ceiling fans and stand alone fans. The owners were great to work with and we appreciated them being accommodating when we accidentally booked an extra day. Overall impressed with our stay and definitely recommend! We would stay at Hale Ohana again! It was close to Poipu Beach but in a quiet residential area. Sometimes we walked to the beach and sometimes we drove the short distance. Lots of shops, restaurants and beauty nearby. The host was prompt with responding to questions. Due to a miscommunication the house was not ready when we arrived. A call to Jeremy (management property) the situation was quickly resolved. He sent two people to take care of the situation and the house was ready for company when we returned from dinner. The location was close to everything that we wanted to do. Quiet neighborhood. The house was spacious with a beautiful big backyard. The washer and dryer was located in the large garage. The kitchen supplies were plentiful, the cabinets where stocked with basic supplies, salt, pepper, oils, sugar and some spices. The ice trays were all filled and ready for use. The beach were a short distance away and there was a supply of beach chairs (some are showing their age). the master bedroom need a new fan and the bed is soft. the queen needs a new mattress, there is a topper that does not fit and your feet hang over. the television is very fussy. It would take several tries to turn on and other times it would come on in one try. We only used it for weather and news so we did not contact Jeremy. Well stocked, only problem we had was we mis understood their handicap accessable and when we arrived you could get through the door with a small barrier and nothing else was assessable i.e bathrooms. That being said they did come out and remove the barrier and did everything they could to make it work for us and even gave us ideas were we could take my dad that he could access. Very helpful and friendly and a nice clean house. They even let us check out late to accommodate the returning of my dad's wheelchair and coming back for our luggage. The only real complaint was it was really hot, there is AC in one back bedroom. We ended up picking up an AC unit at home Depot for the remainder of our time there. Military and Kamaaiana discounts available. Canadian Ohana must account for additional fees on top of the automatic rate that VRBO Quotes for the exchange rate. Credit cards can be accepted with an additional processing fees 2.5% paid directly to VRBO. Number of guests over 6-8 will be an additional fees per $10.00 night per person! Please note: the Service Fee is paid directly to VRBO. This fee is avoidable, please inquire if interested.